Friends! 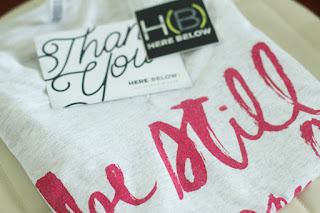 Today I am so excited to introduce you to a lovely company called Here Below. Here Below designs beautiful and super comfortable Christian t-shirts. Their goal is to inspire a life of authenticity, adventure and grace. More than that though their aim is to share the gospel. I can attest that through collaborating with them they live that statement out. Even through this collab they have encouraged me in my walk with Christ and to be more intentional with the gospel. Partnering with companies who love Christ and promote the gospel is something I'm really thankful I get to do through blogging. First off, Here Below's name is a reference from the Doxology. Do you know it? Praise, Father, Son and Holy Ghost. Secondly, I must admit to you that for many years I did not like that song. Not because it isn't a good song (it is). You see, I attended a Christian school for 2 years and I had a really really hard time there. And guess what we sang every day at chapel? The doxology! So whenever I heard that song those memories came to mind. But God is good you guys and He has a way of redeeming things and turning them around. Fast forward a few years down the road and I got married. And my husband Dave likes to sing at home and what did he start singing? The Doxology. Then one night before dinner he said "let's sing The Doxology together before we pray." (I know, it's probably weird to sing randomly before prayer but we do it anyways.) And now about twice a week we bust out that song, and I like it, a lot. I share that story to tell you that God has a way of redeeming and healing past hurts. He has done it through salvation and he has done it over and over in my Christian walk. When Seth, from Here Below, asked me what shirts I'd like that is the big reason I picked the 'beauty from ashes' shirt because that slogan is me. Christ has taken the ashes of my life and turned them into something beautiful that only He could do! I must tell you about the shirts themselves! They are beautiful and super super comfortable. 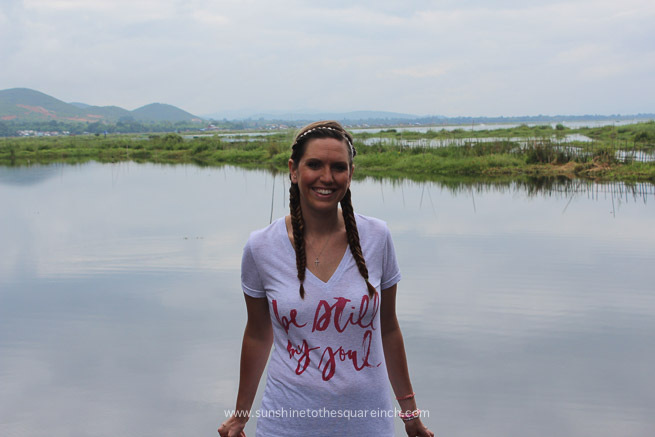 I traveled Thailand and Myanmar in them and they definitely passed the test! Here Below was helpful in making sure I had the correct size so if you have any questions be sure to ask them. You do know Christmas is right around the corner too, right? These would make wonderful gifts! Today Here Below and I are partnering together to give you a shirt of your choice and I'll be sending you a fun souvenir from Myanmar. I'm actually going to let the winner pick what souvenir they would like and they will get an e-mail from me with a few different options. The good news is that this giveaway is open internationally! Wahoo! For me, I'd choose the Soli Deo Gloria tank. Love, love! I love the "Go Into All the World" shirt because it's a personal statement for me. I've been able to go to Vietnam once and China 3 times to share the gospel. i love all of the little shops you find!! :) i would love the blue beauty from dust shirt! I love the "Worthy is the Lamb" shirt. We sang the doxology often before a meal as our prayer. I have such fond memories of everyone coming home for Thanksgiving and I can still hear all of the voices and parts singing together. I like the joy of the Lord shirt and the punk beauty one. So neat! I love both colors of the Beauty from dust shirt, as well as so many of the others! I have actually been eyeing these since they popped up on my feed a few weeks ago when you "liked" them. Haha! Thanks for doing a giveaway! It's amazing you are doing one from Myanmar! Miss you guys, and praying for you! I like the "Beauty from dust" shirt that you are wearing most of all. It's a simple but powerful message.